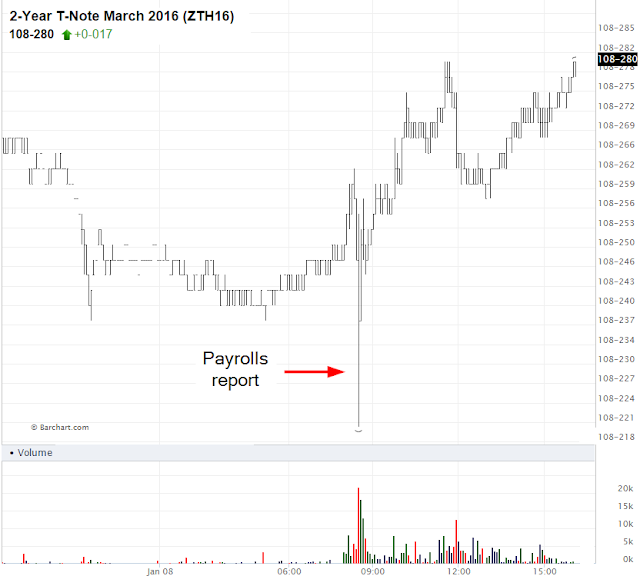 On Friday the US Department of Labor report on US payrolls was significantly stronger than expected. Given such excellent economic news one would think the FOMC is going to continue on its path of steadily raising rates. Fixed income markets however don't believe that to be the case. 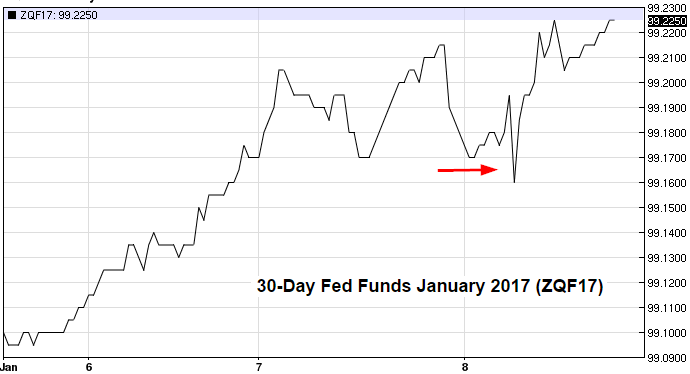 The chart below shows the January 2017 Fed Funds futures contract over the past 3 days. The higher the value the lower the implied Fed Funds rate. The contract initially sold off sharply upon the announcement of the jobs figures but rallied shortly after. 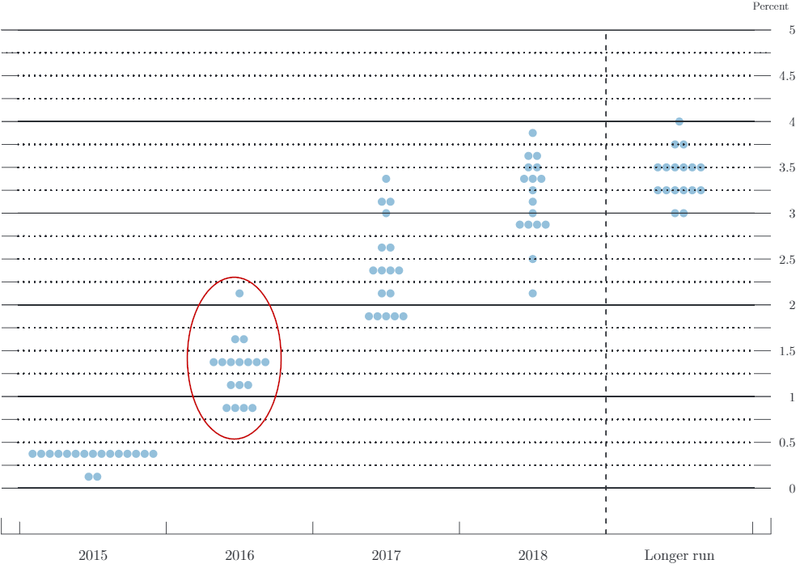 It ended up higher than it was prior to the report, indicating that the market expects the Fed to actually be less, not more aggressive in raising rates - even in the face of this strong employment report. The FOMC dot plot in December indicated that the Fed will hike rates four times in 2016. Surely with such an unexpected improvement in jobs, the Fed has to follow up on its "promises". 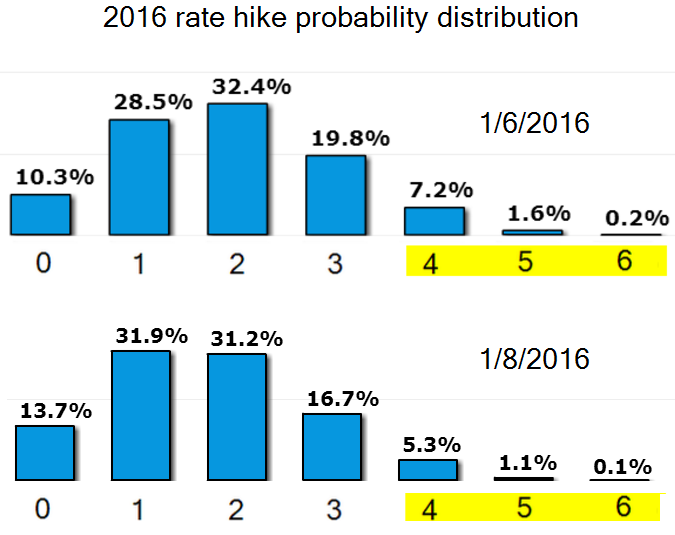 Nonetheless, markets are completely discounting this projection, assigning only a 6.5% probability to a 4 or higher number of hikes in 2016. The chart below shows the futures-implied probability of rate hikes in 2016, with the horizontal axis representing the number of rate increases. This 4-or-higher probability is in fact materially lower than it was a couple of days prior to the payrolls report. We saw a similar reaction in the treasury market, with the 2-year note futures reversing the sharp selloff which occurred when the report came out - and finishing higher than it started. So much for the treasuries selloff many have been expecting. In the next post we will explore why the markets are discounting the latest US jobs reports in projecting the near-term Fed Funds rate path.